The beautiful, sleek 1972 Pontiac Firebird was only in production for a little over half of the year. Read on to pick up details on the reduced production run and industry challenges Pontiac faced in 1972, leading to a diminished number of Firebirds for 1972, making them one of the rarest Firebird models. The low sales of the 71 Firebird and the looming end of the muscle car era began the difficult year the 1972 Pontiac Firebird would face. GM almost decided to scrap the model from the beginning, ultimately producing only 29,951 Firebirds compared to the 53,124 of the previous year. This was primarily due to 174-day strike at the plant in Norwood, OH, which was the only plant producing Firebirds at the time. When work finally resumed in September, GM was forced to scrap 1100 unfinished cars that would not be able to meet new impact requirements set to take effect in 1973. Adding to the already rocky year of the Firebird, new industry horsepower regulations were put in place which allowed only net ratings to be listed. Since the required net ratings were about 20% lower than the actual capabilities, the Firebird’s performance appeared substantially reduced. The new standard allowed nothing over 300hp, so the recently introduced 455ci, available in the Formula, was listed at the required net 300hp instead of the higher potential of 355hp. The respectable 350 V8 in the Esprit was dropped from its original rating of 215 to 160 bhp, while the base model I6 was dropped to just 110bhp. Due to the GMs lack of interest in the project, the 72 Firebird came with only a few changes. The new honeycomb grill matched the honeycomb wheels and vinyl upholstery was offered, the front fender gills removed. Ten new factory exterior colors were added, while ten more were removed. Transmission options included 3-speed manual, 4-speed manual, H.D. 3-speed manual, H.D. 4-speed manual and 3-speed Turbo Hydro-Matic. Interested in Buying or Selling a 1972 Pontiac Firebird? 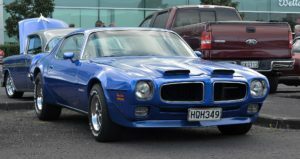 Part of the reason Classic Cars Online US exists is to help connect classic car buyers and sellers, and we’ve added several ways for you to connect, but first, be sure to visit the Classifieds page if you’re in the market to buy or sell classic cars such as the iconic 1972 Pontiac Firebird.